DHCP stands for Dynamic Host Configuration Protocol, One of the basic element found on all networks is a DHCP Server, making it an important part of any network. DHCP makes Network Administration easy because you can make changes to a single point on your network and let those changes filter down to the rest of the network. In this method the Administrator used to collect the MAC Address to them. The list of MAC Address and IP Address was maintained in a Server called as a Boot P Server. When ever client request for IP Address Boot P Server assign the IP. In this method the Administrator used to collect the MAC Address. It gives IP – Address automatically to the clients who is requesting for an IP Address. It provides centralized IP-Address management. DHCP reduces the complexity and amount of administrative work by assigning TCP/IP configuration. Firstly we need to set ethernet interface name as DHCPDARGS in /etc/sysconfig/dhcpd file. Edit this configuration file and update the ethernet name. /etc/dhcp/dhcpd.conf : Main Config file for the DHCP Service. DHCP creates an empty configuration file /etc/dhcp/dhcpd.conf. Also it provides a sample configuration file at /usr/share/doc/dhcp*/dhcpd.conf.sample. To Copy the Sample file, use the following command. In this example we are configuring DHCP for 192.168.0.1/24 LAN network. Assigning IP-Address dynamically has some problem that every time a client system boots it is not sure that it will get the same IP, So it will be tedious task for other systems to find the particular system. To solve the above problem we can do MAC address binding of the IP address for this provide its entity in the fixed address portion. Client configuration is very easy and straightforward. All you need to do is set IP address to dynamic in the properties of lan card. Make sure BOOTPROTO is set to dhcp. Now restart the network services in client system, Dynamic IP address is assigned to ur System. 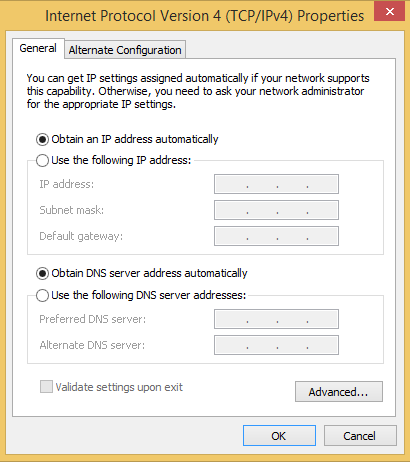 To configure windows system as dhcp clients open lan card properties and select tcp/ip and click on properties and set obtain an ip address automatically.